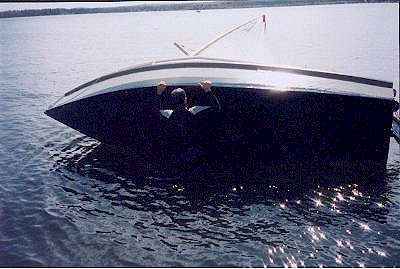 (15SEP98) This issue will report on some capsize testing done by Herb McLeod with his AF3. Next time, about 1October, we'll likely look at some methods for a swimmer to reboard his boat. Chuck Leinweber puts out a very nice magazine that features the adventures of homemade boats at Duckworks Magazine . Lots and lots of photos. Take a look. MIDWEST MESSABOUT ALERT...The 7th annual Lake Monroe Messabout will take place at Lake Monroe, south of Bloomington, Indiana on September 18, 19 and 20. We'll be at the Paynetown Recreation Area. Bob Bringle is in charge at rbringle@iupui.edu. I now have 14 days of sailing in on the AF3. Alas, no pictures yet of it sailing on the water for the same reason as ever, no one else around to take a picture. Most days I am the only boat on the lake. Had one sail where we traveled 20 miles in one day. We did a 6.5 mile section that day in 1 hour 10 minutes with the small sail (69 square feet) on a beam to broad reach (lots of wind). Also managed to turn the AF3 on its side that same day. The AF3 floated well was easily uprighted, boarded and bailed out. Everything in the cuddy stayed dry and we managed to not loose any of our gear. But that is not what I am writing about....."
"I climbed on from the stern. I have a small step on the stern that also doubles as a support for my mast cradle. I put my hands on the stern deck and placed my foot on the step and climbed on board. I must take a photo of this step and send it to you. With the step it was easy to reboard and I could walk around in the cockpit with the water in it and bail it out. Gord then reboarded over the side, which was much more difficult and his choice not mine." Herb looks to have gone through all his tests without disturbing any gear because he had it well stowed. Very important. But a tight well secured fabric cover of the cabin slot would be a good idea in rough going. It should help keep a big wave from sloshing into the cabin and upsetting your day. You must remember that in the conditions that might cause a real capsize things will be a lot more trying. We'll look at ways of reboarding a capsized boat. If you like to spend time looking at drawings of small boats one of the best books to invest in is Howard Chapelle's AMERICAN SMALL SAILING CRAFT. If you turn to page 65 you will see a drawing of the "Old garvey box, substitute for a sneakbox". The sneakbox itself is a fairly refined shape to be seen on page 313. 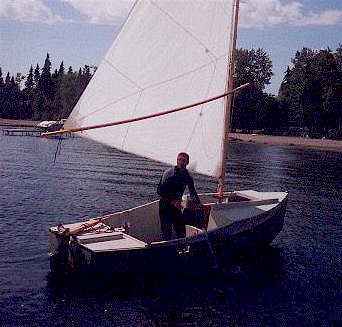 They were small handy row/sail boats used by sportsmen around the Chesepeake a century ago but they live on in boats like the Sunfish that are very similar in size and style. Chapelle's old garvey box is the same size and style but with a simple flat bottomed cross planked hull instead of the round bilged hull of a real sneakbox. You can learn a lot more about the sneakbox on the internet. Start at the Eldritch Press shown in my links. There is a lot of stuff at Eldritch, mostly "literature". But for some good reason there is also a section on classic small boat books including Nathanial Bishop's FOUR MONTHS IN A SNEAKBOX, complete with all maps and drawings which include details of a 1870's sneakbox. Bishop took his sneakbox from Pittsburg down the Ohio to the Mississippi to the Gulf Coast to Florida. He camped almost every night. All was done with oars, no sail rig was taken. Quite a journey! And quite interesting to historians and anyone who lives near those waters (like me). Anyway, Al Tilley is the one who told me about Eldritch and who built the first Sneakerbox. Here is a new design based on a traditional boat, Chapelle's "garvey box". She's the same size and layout as the original garvey box. The prototype was built by Al Tilley of Montrose, Pa. I'm sure she's lighter than the old planked garveys, maybe half the weight because of the modern plywood box construction. Still, she's too heavy for casual cartopping (and not well shaped for it either) because of the extra weight of the deck. There's nothing to be done about it except to go to an open top design like Piccup Squared. But the old sneakbox boats were always decked. Six sheets of plywood make Sneakerbox. The boat has taped seam chines. No jigs or lofting required. Plans are three blueprints with complete instructions for $25. Usually when a design from the Catalog of Prototypes starts getting built I pull it and replace it with another prototype. 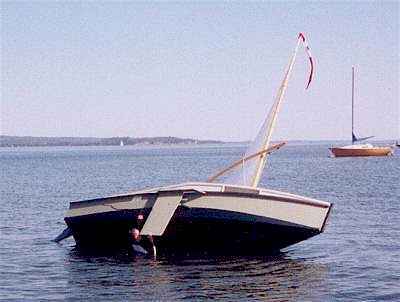 So that boat goes into limbo until the builder finishes and sends a test report and a photo. Sportdory: Word from Dave Burdecki in California was that he had his completed but no word of the launching. You can check out John Bell's Sportdory progress by clicking here . Skat: the prototype Skat builder is Roger Palaski. Up until now he was a mystery man know to me only as "Roger", his Skat plans bought for him by someone else. Then I find out he has his own web page with the Skat construction photos on it! 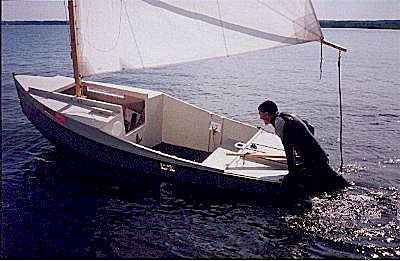 Skat is a small somewhat traditional 12' cat boat with a gaff rig. 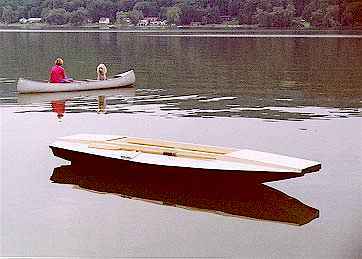 Even has a centerboard, the only boat I've ever designed with one! See Roger's progress by clicking here. Nothing new on the Texas IMB. Click here to visit Tim Webber's page and see some photos of the IMB as of a few weeks ago. Then poke around Tim's web page a bit. Fatcat2: There is an old timer (80 years +) in Minnisota who has completed the hull of a Fatcat2. 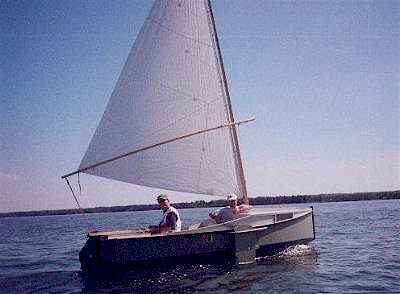 Fatcat2 is a simple 15' x 6' catboat, gaff rigged and multichined. I think the sail rig will be done this coming winter.